Dreams have this strange tendency. When we wake up, it makes us wonder if it was a mere dream because everything so real; as if happening to us... right in front of us! And Jugal Moody’s Toke has a dreamlike effect. Once you turn the last page and read the last line, you will be lost in thoughts and be wondering if you read something or was that a dream! Nikhil Parmer is an engineer. He works in a Company under a manager who is strict. Nikhil’s parents are irritated with his easy-go approach to life. And Nikhil is frustrated with his work and routine life. He desperately churns for a break from his normal life. The sunshine in his life comes in the form of Suparna, an HR in his office. He secretly has a crush on her and her mere presence brings brightness his otherwise gloomy life. He sleeps irregularly mindless of where he is and who is around. And his sleep is always interrupted with dreams wherein a cool dude appears in Mahabharata costume. His looks are so charming that any man would wish that he was a gay! And the cool dude in Mahabharata costume reappears in Nikhil’s dream and asks him to save the World with the help of his friends, which would otherwise be under the control of zombie in few days time. Thus begins Toke... promisingly and interestingly! The story is innovative and the plot is intriguing. It throws light on the lifestyle and attitude of today’s generation. I particularly loved the slang used. The author has not tried to present a work of literature. There are no complicated words or poetic accounts. Instead it is conversational and Indian English. And that’s exactly where the author scores high. We start relating to the characters and they become believable. Slowly, the not-so-believable plot becomes possible. The first-many-pages are an assured page turner. However, eventually, the story loses its charm. When drag your first marijuana, you will feel like it is trivial. As you drag a few more times, you will start feeling divine. But you continue to toke, you will lose track of divinity and even yourself. The World around starts spinning and the joy starts fading. Jugal Moody’s Toke also goes through all these stages. Towards the end, you will be wondering what exactly happened. Toke will make you feel like you have had a toke yourself. It will make you wonder if you are imagining things or you are actually reading something. 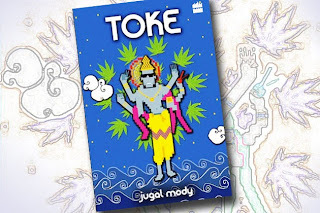 If you are a person who likes to read different kinds of books and has an inclination towards reading almost-impossible plot, then Jugal Moody’s Toke will not disappoint you.